I went on my first cruise at age 40, which many people used to consider young for cruising. Not so much any more. Cruises come in many varieties, to fit budgets, tastes, and age groups. After that first cruise of the Eastern Mediterranean, “Cradles of Civilization” on the Norwegian Cruise Line’s Dream, my husband and I were hooked. If you ask fifty people what they consider the best thing about a cruise, you’ll get at least fifty answers…unpacking only once in the cabin of your floating hotel, waking up in a new exotic port each day, the leisure, the pampering, the shows, the shore excursions…and of course the cuisine. Cruise lines employ top-notch chefs who create exotic gourmet meals, from fresh ingredients, catering to every palate and need: vegan, diabetic, low sodium, gluten free…and the sky’s the limit if you want to indulge to your heart’s desire and gain that average two-pounds-a-day on your cruise. But why should anyone only be able to indulge in these delectable delights if cruising the seas? Those of us who love to cook and enjoy gourmet cuisine should be able to create meals from cruises of the past in our own kitchens. I searched for seven menus of a diversity of cruise lines, from the luxurious Cunard Line, famed for its opulent ocean liners, to a small but highly exclusive line of yachts that offer the most personalized cruise experience. I found recipes for each item on the seven menus, from appetizers to entrées to desserts, cocktails and pre-dinner aperitifs. 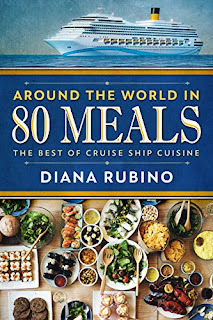 I devoted a chapter to each day of the ‘fantasy cruise’ introducing each ship and explaining where it is located, with information about each cruise line and its chefs. The main focus is on the dinner menu followed by recipes for recreating every delectable morsel. 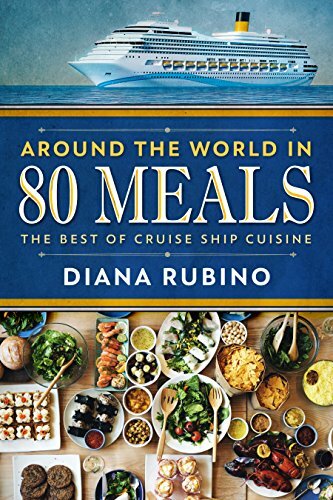 The result is AROUND THE WORLD IN 80 MEALS, THE BEST OF CRUISE SHIP CUISINE.